Established by the Korean government in 1983, Korea Gas Corporation (KOGAS) is the world's largest importer of LNG, and the country's sole importer of this important resource. KOGAS is fully committed to providing clean, safe, and convenient energy to the people of Korea. The company currently operates LNG receiving terminals in Incheon, Pyeongtaek, and Tongyeong, and distributes natural gas and gas by-products via a 2,739 km pipeline network to power plants, gas utility companies, and city gas companies throughout the country. The Incheon LNG terminal is the world's largest LNG receiving complex, and it supplies natural gas to the Incheon and Seoul metropolitan areas, which account for 40% of the country's natural gas demand. Built on a 990,000 m² plot of reclaimed land 8.7 km off the coast, the terminal has two plants with a jetty capable of accommodating two ultra-large LNG carriers of up to 100,000 tons in size and a total of ten 100,000 m³ above-ground storage tanks, two 140,000 m³ underground tanks, and eight 200,000 m³ underground tanks, giving it a total storage capacity of 2,880,000 m³ (Kl). The total gas send out capacity of the Incheon terminal is 4,350 tons per hour. In 1996, Yokogawa Korea installed a CENTUM CS production control system at plant 1 of the Incheon terminal, and migrated this system to CENTUM VP in 2011. With the construction by KOGAS of plant 2 in 2004, Yokogawa Korea installed a CENTUM CS system, and subsequently installed another CENTUM CS 3000 system in 2009. Engineering work is now underway at plant 2 for migration to CENTUM VP. 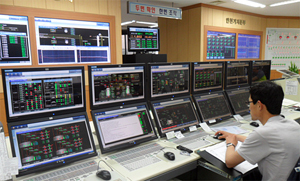 The Incheon terminal utilizes Yokogawa's CENTUM systems for the control and monitoring of facilities throughout both plants, including unloading arms, storage tanks, recondensors, open rack vaporizers (ORV), submerged combustion vaporizers (SMV), and trunk lines with metering stations. At LNG receiving terminals, safety is a paramount concern with the transfer and storage of LNG from carriers. It is very important to maintain a constant pressure inside the storage tanks, which requires careful control of the operation of boil-off gas (BOG) compressors, recondensors, and pumps. By means of sequence functions, CENTUM operators can easily control the process from a remote location, starting and stopping the BOG compressors depending on BOG temperature, gas composition, and volume. 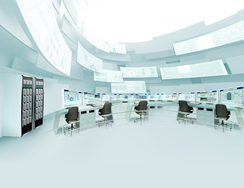 In addition, KOGAS has a disaster protection system for dealing with critical situations, and personnel in the central control room can share information in real time with operators in plants 1 and 2, ensuring a timely and well coordinated response if fire or a gas leak is detected. It is very important for KOGAS to be able to adjust flexibly to shifts in demand in the gas that it supplies to power plants, industrial companies, and residences. 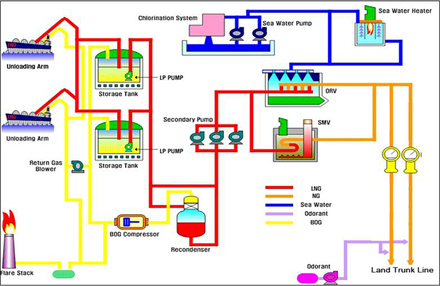 While seawater in an ORV is normally used to cool and vaporize the LNG, in periods of peak demand operation can be automatically switched over to an SMV that relies on the combustion of BOG to vaporize the LNG. Every aspect of these vaporization processes, from the switching on and off of pumps to the control of vaporization temperature and gas pressure, is carefully configured in the CENTUM system. The adjustment to shifts in demand is fully automated at this terminal, ensuring uninterrupted supply. People at the KOGAS Incheon LNG terminal, says, "With CENTUM and other systems, we have built an enterprise-wide operating information system. The visualization of all process data allows us to maintain a clear picture of the execution of our business plans, create optimal LNG supply chain scenarios, and make quick decisions and timely adjustments. With the CENTUM system, operability and safety are enhanced, and operators as well as managers can maximize the effectiveness of their activities." They went on to say, "We appreciate the continual support and the solutions that Yokogawa Korea has provided us. Yokogawa is one of our best partners."